More than a few are pointing to our map of nonpayers by state to show that the highest nonpayer percentages are in reliably Republican states, mainly in the South (Florida is an exception). This is put forth as some sort of conundrum, but the mystery is solved when one realizes that low-income earners tend to be nonpayers, and low-income earners also tend to live in red states. 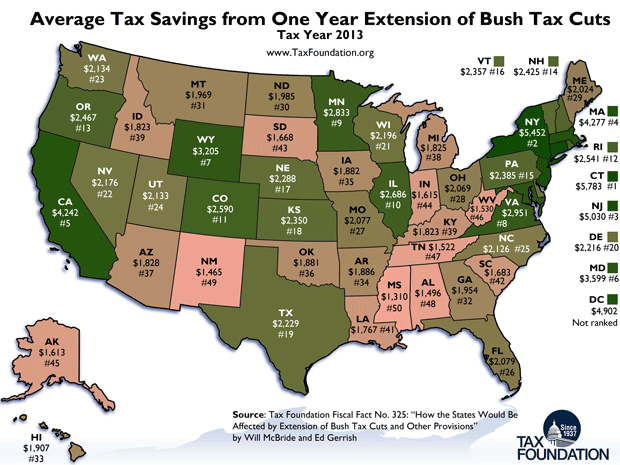 The same relationship is behind another seeming conundrum: the states benefitting most from the Bush tax cuts are solid blue states. The top five beneficiaries are Connecticut, New York, New Jersey, Massachusetts and California.